4.8 out of 5 based on 104 reviews. 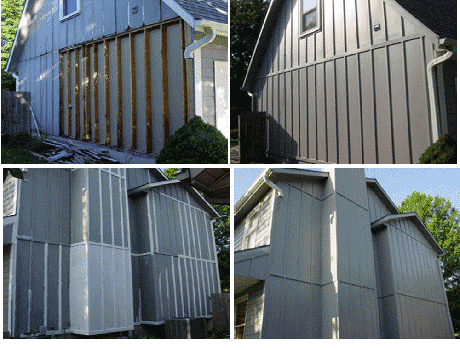 Siding replacement or repair dramatically improves your kansas city's home curb appeal and value. 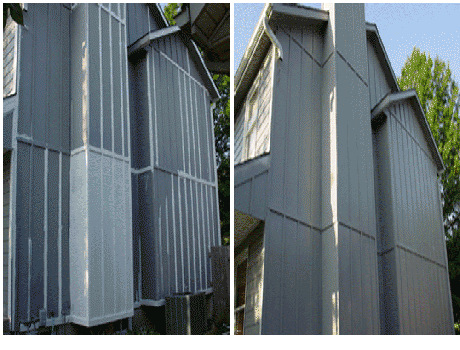 For siding replacement we use the best name brand quality siding on the market today. Most are available in a wide range of popular colors and styles. 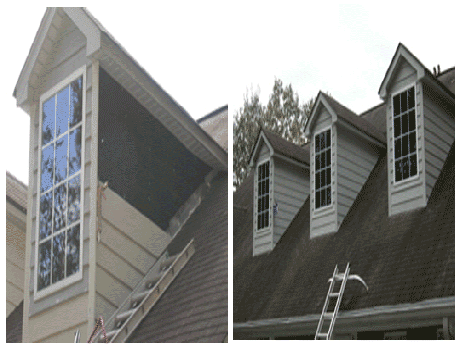 For siding repair services we work hard to match your existing home siding so we only replace what it needed. 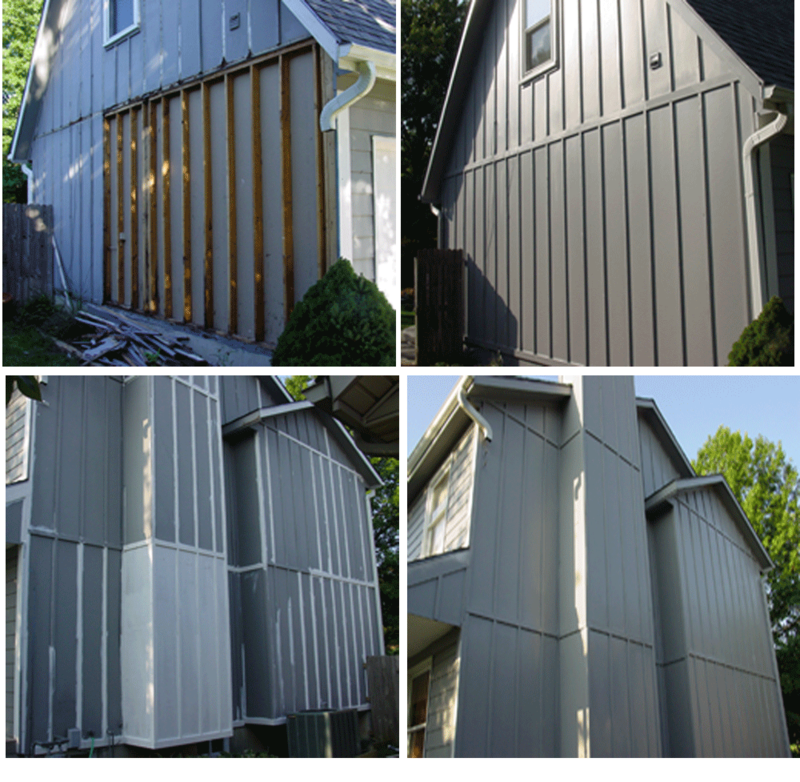 For two decades kansas city home owners have trusted JRS Painting Company for siding replacement and wood siding repairs done right at a fair price. 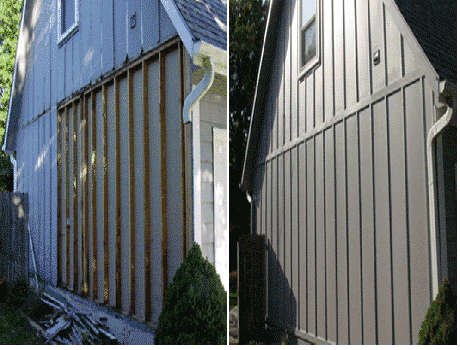 If you have been looking for professional siding repair services in kansas city you're not alone because the majority of kansas city homes will require some amount of siding repair work or replacement before we move forward with the exterior painting process. 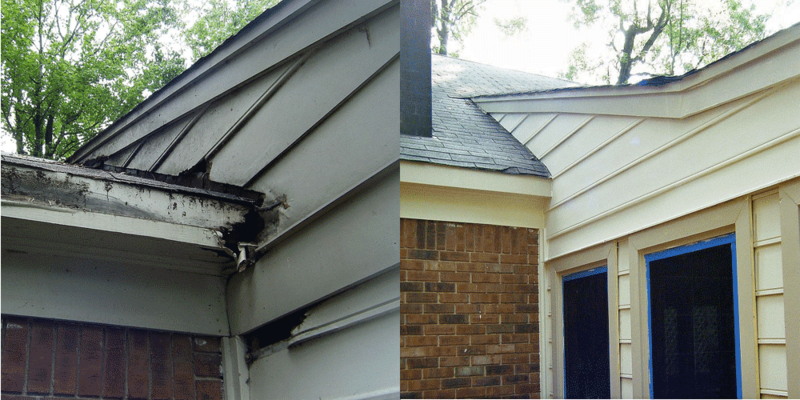 Although problem wood rot areas may appear minor, it is important to find the source and totally eliminate it. 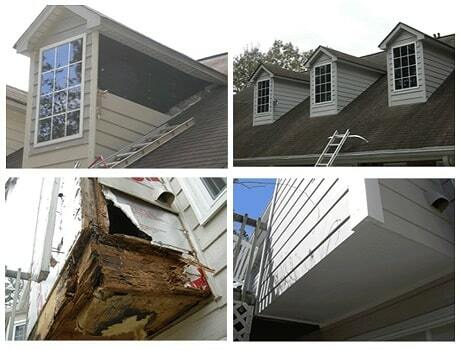 You can trust our wood rot repair specialists who are highly experienced in all types of wood rot repair, dry rot repair and new siding replacement. If it's been too long between your exterior paint jobs you will most certainly notice fading from weather exposure and UV radiation. When unprotected wood surfaces are exposed to prolonged moisture or direct sunlight they will start to develop the early stages of wood rot. Any trim or siding exposed to these conditions will start to expand and contract causing the paint to flake then peel away. In more advanced stages it will eventually collapses and need to be safely removed, the area treated and replace with new material. The most commonly visible wood rot areas will include wood siding, fascia boards, soffits, batten boards, exterior trim boards, brick moulding and wood window sills. Often times the true extent of the wood rot to be replaced may not be known or even visible until work has started since the rotting wood is hidden behind other building materials. 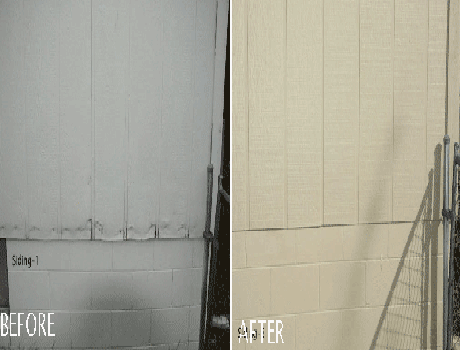 Wood rot repairs can be needed most anywhere on your kansas city home's exterior, however typically we find that masonite siding and wood window trim is the most common. 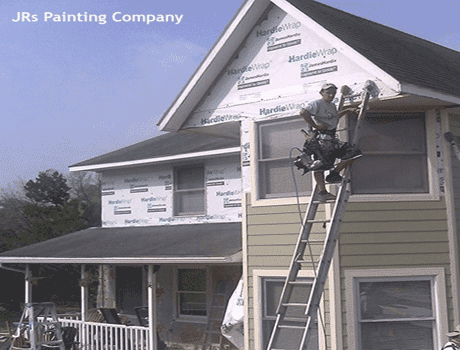 Visit our siding repair photo gallery to see why hundreds of kansas city home and business owners have trusted JRS Painting Company with their most valuable assets. If it's painting the exterior of your kansas city home or a siding replacement project, you will find our team of exterior house painters and wood rot repair specialists committed to deliver a job done right with integrity. Once your siding repair estimate request is received, we will be promptly following up with you to schedule a paint consultation. 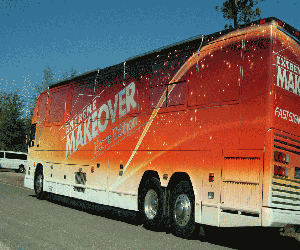 During this time, the details of your project will be discussed, and all questions and concerns will be addressed. Most appointments take about 30 minutes or less. For your convenience, we offer a flexible appointment calendar, with extended evening hours. should i be concerned about wood rot on my siding? absolutely! JRS Painting Company is a top rated kansas city wood rot repair company specializing in exterior residential painting and wood rot repair services. Professional wood rot contractors have to be aware of the different types of wood rot. There are a number of types that can be found in any given property. The first thing that is understood, however, is that in all of these cases, water is needed to not only start the rot, but to keep it going. So, the biggest factor in mitigating wood rot is going to be identifying the source of the moisture and ending it. If you're looking at the wood in your home and it's sort of darker and cracking in a cuboidal way- you likely have brown rot. They're usually pretty distinctive. There are a number of different types and the most common dry rot is one of these. White rot, on the other hand looks lighter, courser, and more fibrous. It may not be as obvious as a brown rot and it's more common in your hardwood materials. Dry rot is only one organism, and that is the serpula lacrymans. Usually any other rot will be classified as a wet rot. Dry rot is certainly more feared than other fungi but like the rest, in spite of its name: it still needs moisture to start, grow, and thrive. It's often found in dark, humid places and that can make locating the source a little hard. It will grow over pretty much anything, whether it can take nutrients from that material or not, so, you'll find it spreading quickly from wood, to plaster, to mortar and other things. It isn't particularly effective in this if the rest of the home is dry so being sure that the humidity problem is taken care of is key. If you aren't dealing with dry rot, but there's still an issue, there's a good chance it's cellar fungus. It is the most prevalent rot you find in properties. Unlike dry rot, it doesn't need a direct water source. It can grow from timbers to simply damp masonry. This is the rot you will typically find on skirtings near walls, where rising damp built in floor joist ends may have issues. Deciding which option is one of the more difficult choices a homeowner may deal with. If the wood has been extensively damaged, it may be best to simply replace it. 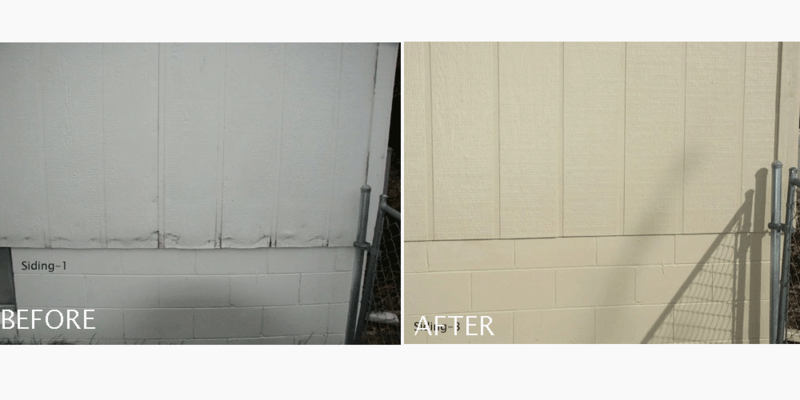 Our siding repair service area includes kansas city, overland park ks, olathe ks, shawnee ks, leawood ks, lenexa ks and all of johnson county, ks.